Take a stroll through Soho and you’d be hard-pressed not to end up in Japanese store MUJI… There’s something about that small store on Carnaby Street that draws passing foot traffic like bees to honey. Inside, shelves are packed from floor to ceiling with countless arrays of practical and simply-designed products that are guaranteed to make your life a little easier. One of the latest installments in the “making life easier” category is a new range of skincare that I first talked about a couple of weeks ago. As a bonafide cleansing oil addict (I currently have 6 bottles on the go) I was keen to see how the new MUJI Cleansing Oil stacked up against some of the more established market leaders. MUJI were good enough to send me out a couple of pieces from the new range, and I’ve been using them for nearly a month now. I know there’s been a lot of interest in this product particularly so I wanted to get my thoughts ‘out there’ without too much delay. MUJI’s offering is cheap. Not the kindest way to open a review, but I am talking money! In a world where you can easily pay £35 for a simillar sized bottle of cleansing oil, this is a bargain. Hand over a tenner and expect change. MUJI’s Cleansing Oil comes in a standard, no frills bottle… the emphasis is on functionality rather than aesthetics, although many would argue that the minimalistic design is more aesthetically appealing than many alternatives. The biggest draw for many will be the fact that this cleanser contains no mineral oils. A plus point indeed! Mineral oil is one of the world’s cheapest substances and is a cause of skin irritation and dryness for many. I’ve moaned previously how one of the most expensive cleansing oils in my bathroom cabinet is full of mineral oils, to see that MUJI (with such a low price point) has taken the care to avoid such fillers, impresses me. Well, the most active ingredient is Hydrogenated Polyisobutene which from my (very limited) research (thank heavens for Google) appears to be a far more sensible alternative to mineral oil. It’s colourless, odourless and tasteless. Non comedogenic, non-irritant, non-toxic, emulsifies in water and is also used in many emolliating products for it’s hydrating qualities. This is all sounds good to me. The other less active (but more recognisable) ingredients include olive oil, jojoba oil, peach leaf extract and orange flower water. Unfortunately, it’s one of the (few) products in the range that does contain parabens, so if that’s something you’re trying to avoid, the MUJI Cleansing Oil won’t be for you. It’s a light feeling oil, practically colourless and certainly odourless. Two pumps is plenty to cleanse a heavily made up face. The oil spreads smoothly over my skin thanks to a fairly thin texture, dissolving my foundation as it goes. It’s easily as good at removing all powders and lipsticks as any I’ve tried… mascara takes a touch more work, massaging it gently into my lashline does the job after a little while. The first couple of times I used the MUJI Cleansing Oil, I did feel a little bit of eye-irritation which was very disappointing. I experienced a slight sting and eye cloudiness as I was cleansing, which although didn’t last longer than a couple of minutes, left me feeling thoroughly disappointed. However, it’s important that I state that I haven’t experienced any irritations since those first few days of using. I can’t explain what caused them, perhaps my eyes were suffering from some irritation already without my knowledge. It’s something I want to make you aware of incase you have particularly sensitive eyes. The product emulsifies nicely in warm water, though not completely… I need to follow this up with a cleanser (which I always do anyway) and there’s only ever been one cleansing oil that I would happily use without double cleansing (and I must review it soon!). This is also one of the least drying cleansing oils I own aswell. For the price and availability in this country, I’d put this in my top five cleansing oils quite happily. MUJI Cleansing Oil is available in store and online from MUJI. It’s priced at £9.95 and quite frankly, is a jolly good buy. so glad to hear there are cheaper cleansing oils out there. thanks for sharing! sounds good with all the natural ingredients in but I can’t believe they’ve gone and stuck parabens in it too! It’s so annoying. Ah well, maybe it doesn’t matter so much with these types of cleansing products which don’t get absorbed so much into your skin? I’m really curious about this – can you give us a hint or will we just have to wait for the review? Oooh intriguing. I’ve never tried a cleansing oil before but this sounds like it might be a good place to start! Recently, I was travelling throughout the Orient and my skin was just a mess. 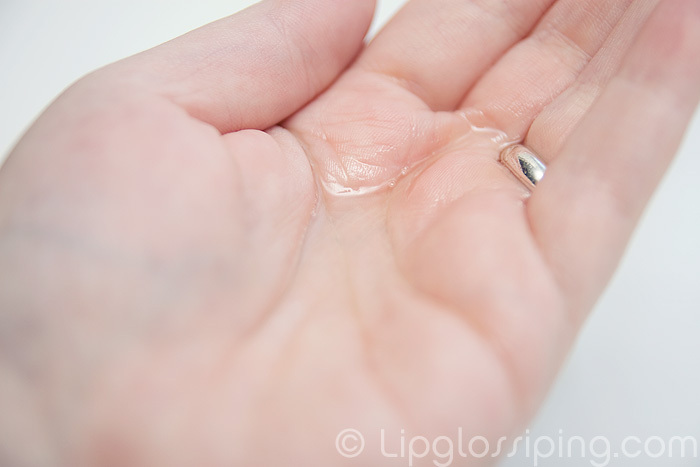 I have combination skin, so the oily parts were really oily and the dry parts, well…..really dry. 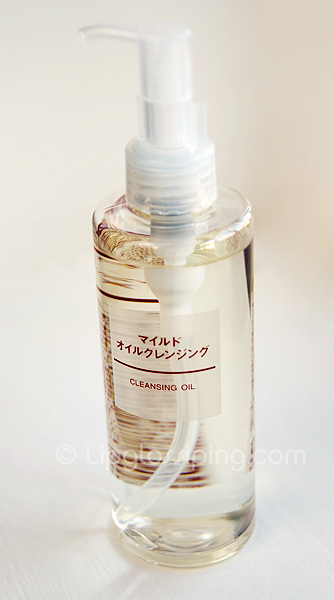 While in Hong Kong I purchased a bottle of the Muji cleansing oil. I don’t know why I did this but my skin looked so haggerd, oily and yet dehydrated, I thought I had nothing to loose. Within a couple of days of using the product my skin overall was more balanced in tone. I have always had the t-zone blues so this was quite new. I’m back home now and continue to use the cleansing oil but I don’t rinse it off initially: I actually blot it off with a tissue to absorb the oil, dirt and makeup, then I rinse and follow up with my toner and usual stuff. It’s winter in my part of the world so I don’t know if I can continue to use this cleansing oil during the Summer but until then, my skin looks great!